Operable Kosher Sukkah Now available in Canada! Convert your porch or greenhouse to a maintenance-free year round Kosher Sukkah! It is a great addition to your home as a four-season living space. Dome skylight operates either manually or pneumatically. Just a flip of a switch lifts up all roof sections. 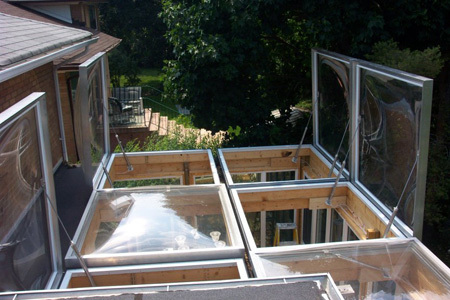 Sukkah can be as large as 14ft X 20 ft.
Aluplex Skylights are widely recognized as Canada’s premier skylights. 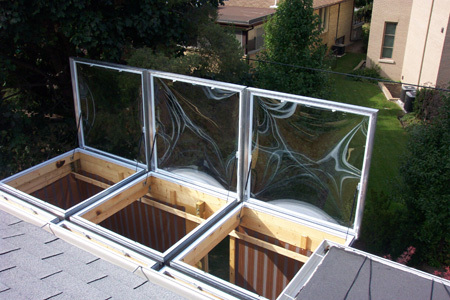 Every standard Aluplex skylight features a shatterproof, impact resistant, double acrylic dome. Our frames are thermally broken and mechanically constructed to prevent condensation. We stock more than 10 different sizes of skylight overheard glazing system: octagon, triangular pyramid, flat or domes. In addition we also manufacture solariums and greenhouses. Home, office, industrial building, new construction or renovation, Aluplex, does it all. Please visit our website for more information and to view our photo gallery.